How to Get Your Digital Marketing Approach right? Startups typically have two major challenges to overcome – Time and money. Though time is money by the old age saying, here we are considering the importance of both separately. In a short period of time, startups have to create the impact, grow their business as it is a question of survival. Either grow or perish seems to be the order of the day. At the same time, most startups do have limited resources (money and people) to create that impact in that short period of time. So the question unfolds as to how this can be effectively achieved in today’s world? You cannot do everything right. We are not in a perfect world, so you need to take right steps; doing right things are more important. Do you really know who your customer is and their need? Focus on your customer and their need. Rather than creating a product or service, trying to spend your resources and energy into selling it (I am not referring to blue ocean strategy here) do understand your prospective customer’s pain and/or gain. If you are not solving a big problem (like Uber, booking a taxi with a click of a button rather than waiting on the streets), or not able to demonstrate a big gain (like Apple iPhone, that created a bigger impact through rich user experience) then you may have to seriously relook at your offerings. Else create a ‘differentiator’ that stands apart. Bear in mind, you don’t need to be miles ahead to win a race, but just nose ahead! Create and expand your brand identity digitally It is a no brainer that startups need to create their brand identity, and not think that the brand building initiative is only for established or large enterprises. It is all about creating differentiation, building trust; and digital will be an easy and cost-effective way to build your brand. The first step is to create a website that resounds well with your business. With good dot-com names virtually not available, this might need a lot of searches to arrive at the right name that can strike a chord with your customers as well. 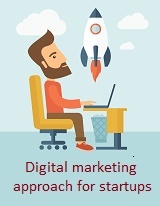 Cheap digital marketing Vs cost-effective digital marketing I do keep receiving mailers that say that they can get website page rank in top search results; and that too at very cheap rates. I do wonder how this may even cover the cost of such resources if it has to be done in the right way it is supposed to be. To top it all I get zapped when they list out strategies that were used a few years ago, that’s not going to work in today’s scenario. Of course, how many do really know Google’s new algorithm released this year? Many startups have come back to us after experiencing these cheaper options, as they realized it is just a drain of money and time. Here the important aspect to note is that, time loss is a precious loss; and you have already burnt sufficient amount of your limited resources (funds) hoping that digital is going to create that impact. If it didn’t work, don’t blame digital; just that you didn’t do it right! So go for cost-effective digital marketing that has a well thought out strategy and execution planned, with clear timelines. Pick the right strategy You all very well know that no one size fits all. Digital is beautiful in that way, because custom strategy can be carved for every one of you – be it a boutique, services firm, product startup, retail outlet, etc. I have stressed the need of SEO many a times in my earlier articles; a balanced approach to SEO, SEM, and SMM is important for you to succeed in this business. There are strategies (pre-launch, during launch, post-launch) that you need to pick depending upon the stage of your startup. Do not put all eggs on one basket (Rephrased: Do not spend all your money on just one strategy) It is always advisable to go for A/B testing. Create two or more sets of messages (needless to mention across social channels, Adwords, etc.) to see which one works best. Fine tune and try to see if improvement in performance is seen. Result is always a moving target and so constant fine tuning is essential to get the overall momentum and impact right. I do notice, many make the mistake of spending their precious funds on a particular message, and come to a conclusion that digital hasn’t worked. I was not surprised because the messages were not right, or the audience was not chosen right, or probably wrong timing. Be it LinkedIn, or Twitter, or PPC, you need to take a balanced call as to which combination can maximize your visibility and achieve your set objectives and goals. It is easy to say ‘go digital’. But digital is not just a technique; it is a tactic (strategy). Digital certainly can be done in a cost effective way, and more importantly measurable. You will be able to see where your dollars go, with reference to your spends on various buckets. So, starting this New Year 2016, are you ready to go digital more effectively?